Wild weather brought chaos to Australia's east coast Friday, driving a huge freighter aground in tumultuous seas, sweeping cars into flooded rivers, disrupting flights and cutting power lines. Rescuers were frantically searching for several people feared missing, including a family whose car was swept away when a highway collapsed in torrential rain, authorities said. Helicopter rescue pilots braved gale-force winds to airlift 21 crew from the stricken ship as giant waves threatened to beach several other vessels, sparking a series of distress calls as they were dragged closer to the coast. 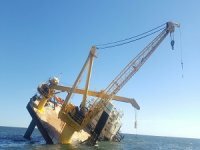 The Filipino and Korean crew on board the 30,000-tonne coal carrier Pasha Bulker, which ran aground off Newcastle harbour north of Sydney, were winched from the deck one by one and flown ashore, officials said. 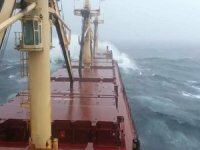 Monstrous waves crashed over the Panama-registered freighter as it lay grounded on a reef just a couple of hundred metres (yards) off a popular swimming beach, dramatic television footage of the maritime disaster showed. "It's getting absolutely belted at the moment, it's an amazing sight, the spray coming right over the top of this huge tanker," a witness said. 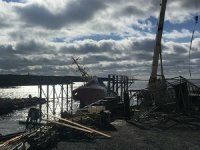 The hull of the ship was intact and did not appear to be leaking any of its 700 tonnes of fuel oil but was "taking a pounding," a spokesman for the New South Wales maritime authority told AFP. "Pollution response teams are on stand by," said chief executive Chris Oxenbould. "However, weather conditions are so bad that deploying any measures to combat potential pollution is not possible at this stage." 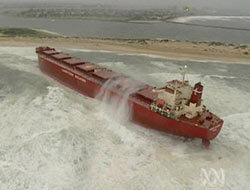 There were concerns for several other ships off the coast as waves reached a reported height of 17 metres (56 feet), New South Wales Ports Minister Joe Tripodi said. 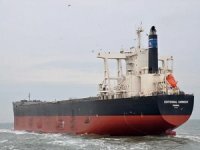 The national transport ministry said the Sea Confidence and a second ship, Betis, were both expected to run aground as they struggled about a nautical mile offshore north of Newcastle. 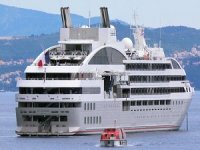 Another ship, the Coral Emerald, was also in distress and dragging its anchor but was a bit further out, a spokeswoman said. Newcastle is a major coal port, and dozens of ships regularly ride at anchor offshore as they await their turn to load. 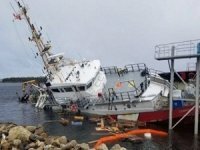 "Through the night they were picking their anchors up to move out into deep water to get away from the coast and nearly all of the ships have successfully done that... but sometimes ships have problems," said harbourmaster Tim Turner. As darkness fell, the maritime authority said tugs were on hand to assist the struggling ships. "Other ships off the coast are also experiencing difficulty, but have managed to anchor and are not in any immediate danger," said Oxenbould. The weather also wreaked havoc on shore, with police saying they had received several emergency calls about cars being swept off roads, with up to seven people feared missing. Some reports put the figure as high as nine, but conditions made the toll impossible to verify. In the worst incident, five people were missing in floodwaters after a road collapsed in Somersby north of Sydney, an ambulance spokeswoman said. Another search for an elderly couple believed to have been in a car swept off a bridge in the lower Hunter Valley, also north of Sydney, has been called off until daybreak due to bad weather and darkness, a police spokeswoman said. The weather, which was expected to get worse, blacked out at least 6,000 homes in Sydney and caused delays to international and domestic flights at Sydney Airport. Swells up to five metres high in Sydney Harbour put a halt to some peak-hour ferry services, forcing thousands of people onto buses and causing major traffic problems.